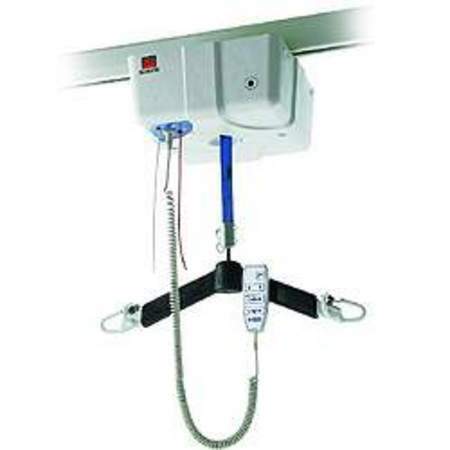 Because caregivers have so much to do, the dedicated ceiling lift is right with the patient ready to be used anytime. The caregiver does not have to spend time either waiting for another lift or going to find the lift they need. With the increasing number of heavy and obese patients, you need a lift that will help your caregivers in those special circumstances. With a 190 kg- 365 kg (420-800 lbs.) capacity, the Voyager Series lift is certified to ensure that you are able to handle your heaviest patients. The patient's comfort is extremely important. The soft start and stop electronics in the Voyager Series lift ensures the lift moves gently without sudden or jolting movement. The charger is placed right inside the rail to give the system a clean look, avoid the need for wall-mounted items and to make it simple for caregivers. The lift simply needs to come in contact with the end of the rail and it automatically charges. The intelligent electronics allow the lift to remain indefinitely connected to the charger without damaging the batteries. Since the batteries are not a memory type, the lift can be left on the charger, making it ready for use anytime. The charger also works efficiently to charge a low battery within 2 hours. To avoid a situation where the lift would not have enough power to perform a transfer, the caregiver is warned when the batteries are low - both with an audible "beep" and a flashing light. In addition to the low battery warning, the system will not allow a new transfer to begin should the batteries lack enough power, protecting them from permanent damage. However, if a transfer is already in progress when batteries loose power, the system is smart enough to ensure the patient can be safely lowered. It is extremely important that the lift be operational at all times. Accidents happen so our handsets are built sturdy and watertight. Our handsets are custom made to ensure they are able to withstand the bumps of normal, everyday use. Emergency controls located on the lift itself are easily accessible should the handset fail, allowing the patient to be safely lowered into a chair. In the interest of making caregiver tasks more efficient, the fast, efficient motor transfers the patient with a comfortable pace. The lift operates quietly, so patients are more secure and relaxed when being transferred. 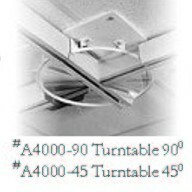 This feature comes automatically with our 4 way or horizontal motor lifts. Caregivers have enough to worry about without needing to remember to return the lift to the charger or to take the time to do so. This function does it all for the caregiver - saving them time and ensuring the lift is always fully charged and ready. To make sure that the carry bar does not get in the way, this feature raises the carry bar to its highest position, takes the lift to the charger, then lowers the handset and carry bar back down to the right height to reach the handset next time. The automatic return to charge is also smart enough to know when someone is in the lift - so it stops immediately. This optional feature safes a great deal of time in large rooms with multiple beds. Imagine a room with 4 bed and a U-shaped track that covers all the beds. The charger is located near bed number 1 and the patient who needs to be transfer is at bed number 4 - the opposite end of the rail. Hit the PPP button 4 times - then go to your patient and place the sling around him/her. The lift will raise the carry bar to its highest position, move along the rail until it gets to the fourth bed, then lower the carry bar to the right height. By this time the caregiver is ready to transfer. In addition, the caregiver can send it back to bed # 2 by pressing the PPP button twice. The Voyager Series lift has several features for emergency circumstances. 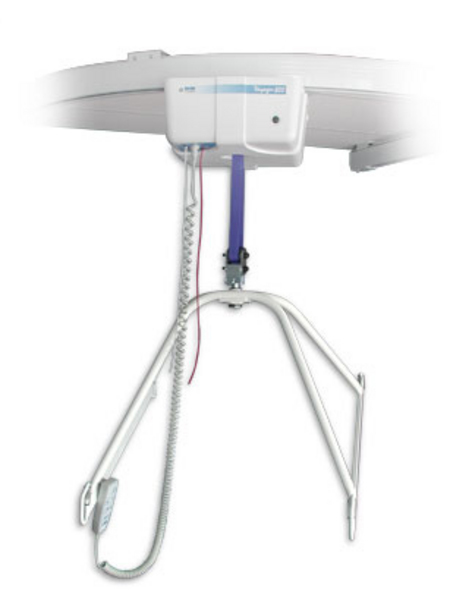 The emergency brake, emergency stop, electrical and manual emergency lowering option as well as the safety testing below ensure the patient and caregiver is protected and safe. CSA 601.1/UL2601-1 & ISO 10535 -This certification is provided by an independent third party and ensures the lift and charging system are 100% safe. The Voyager Series lift is in accordance with the new European standard that applies to equipment that transfers persons. The Voyager series lifts have passed a series of tests which, among other things, ensures the lift can hold 2.5 times its capacity and that the motor will do more than 10,000 cycles and still maintain its strength. The Voyager 420 will satisfy the majority of manual handling requirements with a maximum user weight of 190kg (420lbs). The Voyager 420 is available in a 2-way (powered vertically, freewheel horizontally) or 4-way model (powered horizontally and vertically ). The standard Oxford spreader bar supplied, allows use of the full Oxford sling range. The Voyager 550 has all the features of the Voyager 420 but will lift 250kg (550lbs). 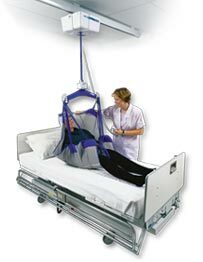 The Voyager 550 is suitable for manual handling where a patient exceeds 190kg (420lbs). *No longer in production. Spare parts are still available. The Voyager 800 has been designed to lift 360kg (800Ibs) and is the perfect answer for bariatric or specialist institutional requirements. The Voyager 800 hoist has all the features of the Voyager 420 and comes in a 4-way (powered vertically and horizontally) model only. Whether you install tracks in one or several rooms, the Voyager series will help you and the patient in all situations without physical effort on the part of the caregiver. 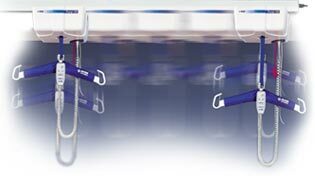 The emergency lowering device can be operated by a simple pull of a cord. The low-battery indicator ensures you never have to ask yourself when your Voyager needs to be recharged. 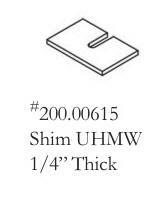 The high-strength track system easily installs into any ceiling - new or old - while being discreet and esthetically pleasing. A 2 way only is powered up and down and a assistant would be required to push the patient along the rail where as a 4 way is powered both up & down and side to side. 90 Degree Of Turn $1995. 45 Degree Of Turn $2166. 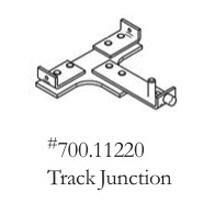 All track sections include all required bracket's, spacers, washers and hardware required to install them. 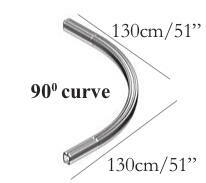 30 Degree 76 mm Curve $387. 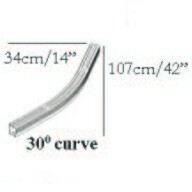 30 Degree 144 mm Curve $487. 45 Degree 76 mm Curve $387. 45 Degree 144 mm Curve $487. 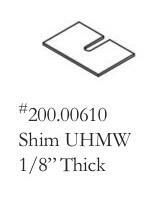 70 Degree 76 mm Curve $387. 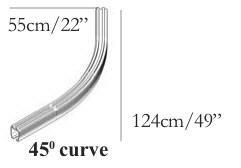 70 Degree 144 mm Curve $487. 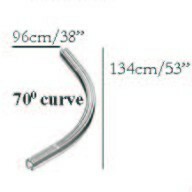 90 Degree 76 mm Curve $447. 90 Degree 144 mm Curve $587. 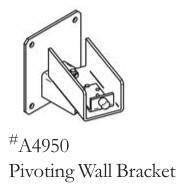 The Pivoting Wall Bracket allows you to support the rail from a wall instead of the ceiling. 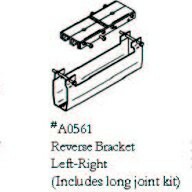 This Bracket requires wall modifications as it is meant to be bolted to two 2 X 4 studs. 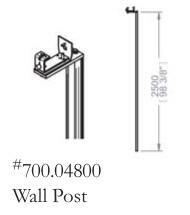 The End Stop is used at the end of a rail run to cap off and secure the end to stop the lift when it reaches the end. 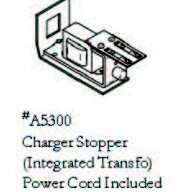 The End Rail Charger serves to uses. 1st it serves as a End Stop 2nd it serves as a automatic charger for the lift. ( Please Note ) that you automatically receive one of these with the purchase of your lift. 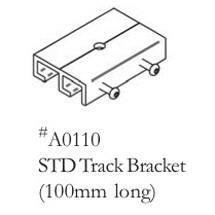 The Standard Track Bracket is used to support rail to the ceiling. They are secured to the ceiling using a 3" Inch lag bolt. 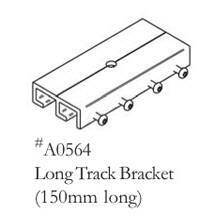 (Please Note) that you automatically receive all the brackets you will require with each section of rail ordered above. 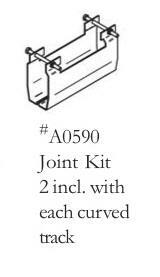 The Joint Kit is used to add support to the joining of two rails however is not required and offers more of a cosmetic service. 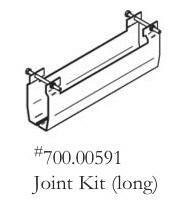 The Reverse Bracket with Joint Kit Is used when you are using a turn. 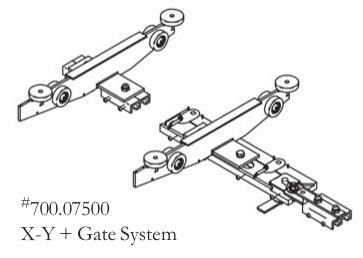 The turning rail can be used to go in ether direction yet the teeth change direction depending on the end that is used to attach to. 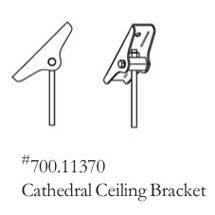 This bracket can be replaced by simply using two standard brackets at the union.